Filmed over 211 shoot days in nine countries and five continents over four years, This Changes Everything epically re-imagines the vast challenge of climate change. 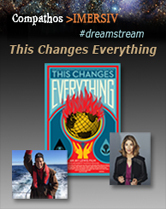 Directed by Avi Lewis, and inspired by Naomi Klein's international non-fiction bestseller This Changes Everything. Klein builds to her most controversial and exciting idea: that we can seize the existential crisis of climate change to transform our failed economic system into something radically better. FUSE - "Design, Media, Fashion and Entertainment collide to produce colossal game-changing impact"
2014 PANEL: Game-Changing Media at the Nexus of Transformative Entertainment, Impact Investing, and Sustainable Commerce. Success stories and strategies to engage participants, fuel sustainable markets, and drive social change. Multi-media presentation: "Mythical Imagination Journey"
An "Imagination Journey" is a poetic and visual narrative which takes the viewer on a timeless journey, inviting them to re-imagine their relationship with nature and to reinvent the stories and myths surrounding its majestic living qualities. Often, our minds are bombarded with unending streams of information and visual stimulation while our imaginations and capacities for foresight and creativity are left untapped. We believe that imagination will be the primary driver of human ingenuity and economic growth in the future. Our capacity to "listen" to nature will play a huge part. "...every individual matters, every action counts"
What can eleven young people, a daring scientist, and millions of online supporters achieve in 100 days in the jungle to stop deforestation and save Planet Earth? Rise of the Eco-Warriors tells the story of a group of young people selected from across the globe who leave their known worlds behind for the jungles of Borneo. They team up with acclaimed scientist Dr. Willie Smits, who runs an operation to rescue displaced orangutans, regenerate forests and support the local Dayak communities. He has a bold and ambitious plan for a long-term solution to the crisis unfolding from massive deforestation. This is a story about what it takes to be an eco-warrior, an individual willing to step up and do something to avert a global catastrophe. Story participants from around the world are driven by the belief that we can save our forests, and it is better to do one thing than nothing at all. Please join us at 7:20 p.m. (03-SEP-14) for this amazing film adventure, to include "Stories that Move Markets" session around the film's global impact with Co-producer Mark White & Cynthia La Grou, Executive Director at Compathos Foundation. Students will have the opportunity to travel with partner, Global Citizens Network (GCN), to Pernambuco, Brazil for an exciting 14 day culturally immersive media expedition. GCN has been recommended by National Geographic, Budget Travel, The New York Times, NEED Magazine, and Oprah Magazine as one of the "Best Volunteer Vacations." A Film Forum that lifts the spirit, sparks the imagination and elevates positive change. RELEVATE brings together social innovators, cultural creatives and community-led organizations to illuminate our world view and ignite cross-cultural conversation. With extraordinary films and discussions, RELEVATE reveals a bigger picture while inspiring us to take collective steps towards local and global transformation. Compathos premieres and screens critically acclaimed releases, undiscovered gems & award winning documentaries which account for a range of environmental and humanitarian impacts. We aim to not only illuminate educational films, but the entrepreneurial artists that are standing in the gap with their amazing talent, energy and vision. Our six month series, "Compathos Film with Social Impact Director Series" in San Francisco premiered films such as Wasteland, I AM, Fish out of Water, The Stream, The Turning Point and more. Each film included guest directors and speakers such as Hollywood Director Tom Shadyac. Partners included BAVC, Intersection for the Arts, HUB Soma, Feel Good World, and Explore.